Fold four 28x12-inch pieces of foil in half to make four 14x12-inch rectangles. To assemble chicken bundles, place 1 chicken breast on each piece of foil, tucking under thin tip of the chicken breast. Fold up edges of foil slightly. In a small bowl, stir together the oil, lemon juice, basil, salt and pepper. Drizzle oil mixture over the chicken breasts. 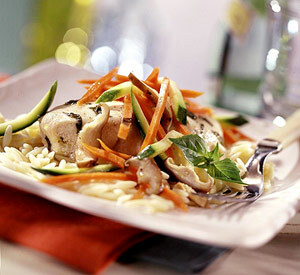 Top with mushrooms, zucchini and carrots, dividing equally among chicken bundles. Bring up 2 opposite edges of foil; seal with a double fold. Fold remaining ends to enclose the chicken and vegetables, leaving space for steam to build. Place foil bundles on a shallow baking pan. Bake in a 375 degree F oven for 30 to 35 minutes or till an instant-read thermometer inserted into chicken registers 170 degree F (carefully open foil when you check doneness). Serve in foil packets or transfer chicken and vegetables to serving plates and drizzle with cooking juices. If you like, serve with rice or orzo and garnish with basil. Makes 4 servings.